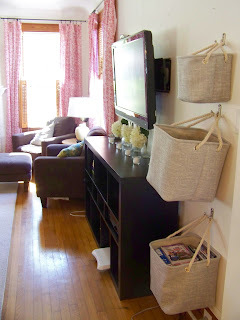 We've made a few living room improvements lately and one of them is the addition of some new storage baskets. 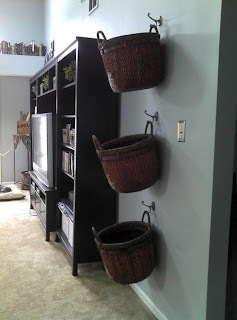 I personally love using baskets as storage. The dogs alone have 3 baskets for there stuff and I love being able to pick up and dump all of their toys into an out of the way place in under a minute flat. 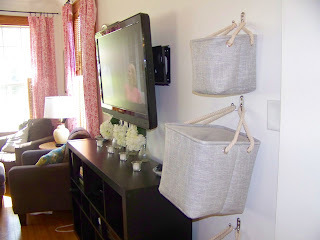 While I love the easiness of baskets, I don't always love the baskets on the floor so when I saw this on Pinterest, I thought it was a great idea. I did have a few concerns with the inspiration pic. One, it looked to me that if you put anything even remotely heavy in those, the handles would rip off. Two, the baskets in the pic looked really huge to me and three, I didn't love how if you did put things in the basket, they looked like they would lean forward and maybe pop off the hook. Since I loved the idea of the pic but not the execution, I went looking for baskets and hooks that would solve my problems. 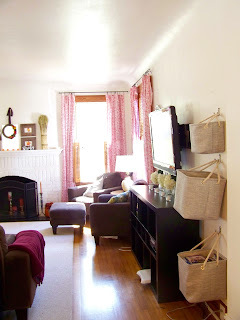 After a lot of searching, I eventually found these fabric baskets at Home Goods. They are super sturdy and have these awesome rope handles. They also have flat sides so they rest flush with the wall instead of tilting out. The second item that made these work for me were small double coat hooks. Since there are two on the same level, I can hook the rope handles to either side which serves two purposes. The first is that since both handles are supported, the baskets themselves can hold a lot of weight and won't tip forward. The second is that since the tension from the weight of the baskets isn't pulling straight out from the wall so there isn't a lot of strain on the hooks. I love how these baskets work so well and aren't massive so they fit the scale of the room. The bottom baskets has all of our dvd's in it (ALL of them) and the top smaller basket holds all of our cd's. The middle basket is currently empty but we are planning on using it for a downstairs changing station for the baby. Since all the dvd's and cd's are now in the baskets, they no longer are cluttering up our book self so it looks much cleaner and streamlined (instead of packed to the gills). One other benefit is that little fingers now can't "inspect" every dvd by taking all of them out of their cases when they come over. Overall I'm super happy with the look and functionality of the baskets. 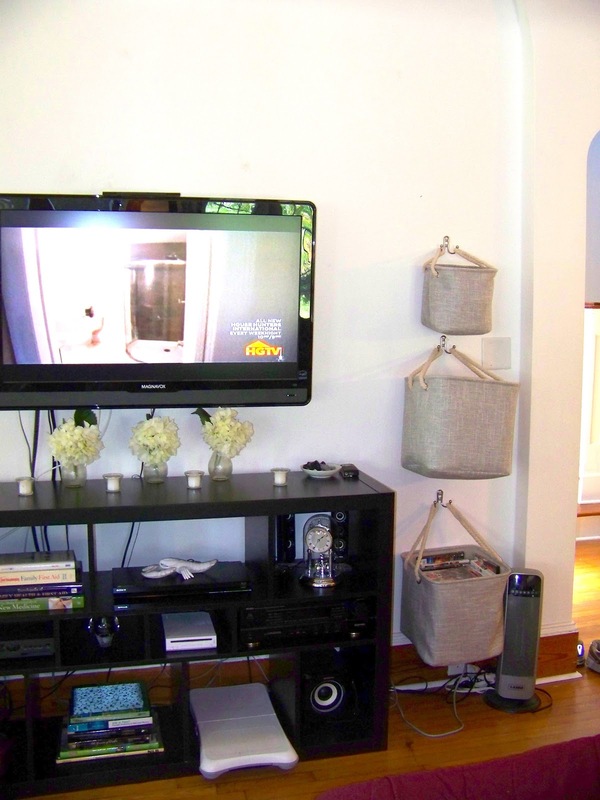 I can't wait to do some other little improvements in the living room but for now, this definitely helps. These turned out so cute :) Stopping by from Serenity Now! Cute! Great ideas! I would LOVE for you to link this up at my Ginger Jamboree Link Party! !